DizBoy's Blog: Chidinma Okeke's Lesbian Video: Her Friend Speaks. 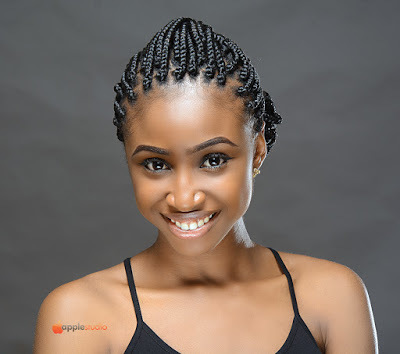 Chidinma Okeke's Lesbian Video: Her Friend Speaks. It is true, that you may not know her personally, but remember she is someone’s daughter, someone’s sister, someone’s favorite neice, someone’s grand daughter, she is human, and you are human. And we all as human beings are gifted with a conscience. For some others you may say “Finally she has fallen, finally this evil has befallen her, what is my concern?” Shakespeare wrote “the evil that men do lives after them”, sadly for some,it catches up with them in their lifetime. Every human life has value, her life nonetheless has value.If you are and were not responsible for creating her,if indeed you don’t know what it is to create a human life,then don’t write her off just yet. I don’t see how her case can help solve this problems, so I choose to stand by her. I would not justify her actions but I would rather not pass a death sentence on her.I will rather stand by her, even though I’ve met her before. I choose to express faith in her,not in who she is or was,but in who she can be! 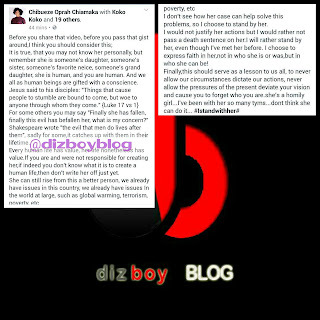 Finally,this should serve as a lesson to us all, to never allow our circumstances dictate our actions, never allow the pressures of the present deviate your vision and cause you to forget who you are.she’s a homily girl…I’ve been with her so many tyms…dont think she can do it… #Istandwithher# "